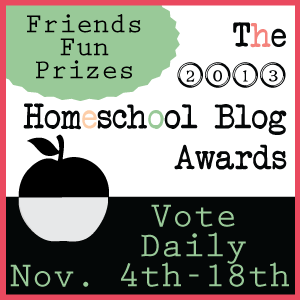 Catholic bloggers are rocking one specific awards platform, the 2013 Homeschool Post Blog Awards!! Friends, let’s make this a Catholic sweep! Let’s keep our faith front and center by supporting Catholic voices, opinions, projects, photos, curriculum designs, homemaking styles, crafts, plans, encouragement, traditions, liturgical season activities homeschool methodologies, resources and more visible and prominent. All of the bloggers are winners, simply by virtue of being courageous enough to speak the unpopular Truth in our current culture. That’s a fact. And because of that, nomination in itself is huge. Let’s make even more of a statement and vote Catholic in the 2013 Homeschool Post Blog Awards! 1. You can vote in each category, once per day, per device until November 18! 3. Please spread the word by tweeting, pinning, sharing in some form, this post or the the HSBA post with voting details. To visit any of the blogs, just click its name. Remember, friends, vote each day til November 18! If you know of a Catholic blog that was a nominated and is not featured here, my apologies. Please advise and I will add the links.